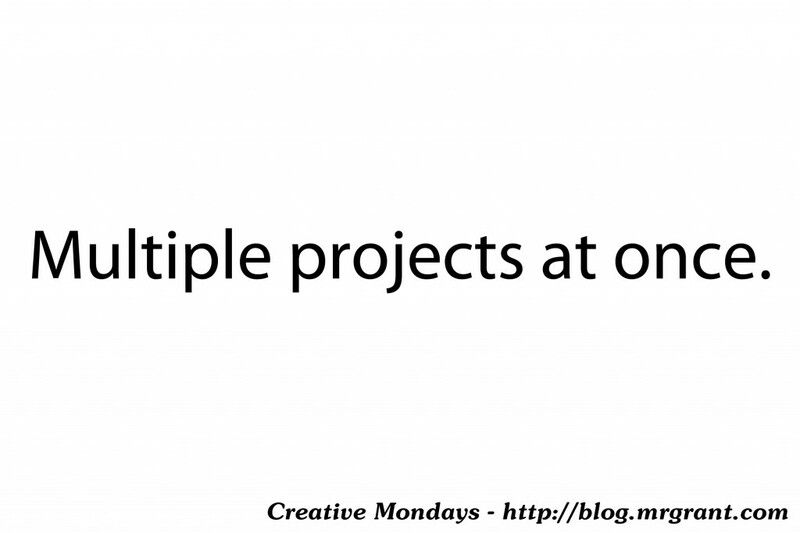 Creative Mondays #035 – Multiple projects at once. Today I want to talk about a creative thought that hits close to home. Having too many projects going at once. This is something I have a particularly rough time with. I usually have way too many creative projects going at one. At any given time I have ideas for audio podcast scripts, video podcast scripts, Throwing Toasters songs, completely new show ideas I want to develop and more. Be working on a bunch of projects so that if some of them don’t work out, you’ll still have others to work on. The inherent danger in this, though, is that you have so many creative projects you are working on that none of them get done. This is certainly something I run into, however I like to think I prioritize creative projects pretty well. I will focus on one particular project and work on that one for awhile, but in the meantime I’ll be making small amounts of progress on other ideas. I find that working on multiple projects also keeps me from suffering burnout working too much on one project. Moving from project to project keeps the creativity flowing in my mind. Of course any creative project that someone is paying me to create takes precedence over personal ones that do not pay because, you know, money. When working on my own creative projects I often wear many hats: writer, producer, performer, editor, publisher. I can do all those jobs and often do. Though I’m not a rabid fan of Seth McFarlane, I do admire his work etheric on Family Guy. He created the show, writes it, performed in it and more. Back when there was a possibility of a Dr. Floyd television show, I was eager to do all those things should the show go forward. In my own projects now, I’m excited to do all those things. Sometimes, I find, we MUST be all those things in our own creative work. At least until we are as famous as Seth McFarlane and we can have other people cover some of other aspect. Are you an artist handling multiple creative projects at once? If so, how do you keep them all straight and get them all done? Let us know in the comments below. Have a great week!